The advanced reading for Q1 2018 U.S. GDP will be revealed tomorrow at 12:30 pm GMT. There’s therefore a good chance that the Greenback may get a volatility injection. Oh, do note that the U.S. GDP report also comes in three versions: (1) the first or advanced estimate (2) the second or preliminary estimate, and (3) the third and final estimate. And the GDP report scheduled for release tomorrow is, as the title says, the advanced or first estimate. The advanced estimate for U.S. Q4 GDP growth was released way back on January 26. 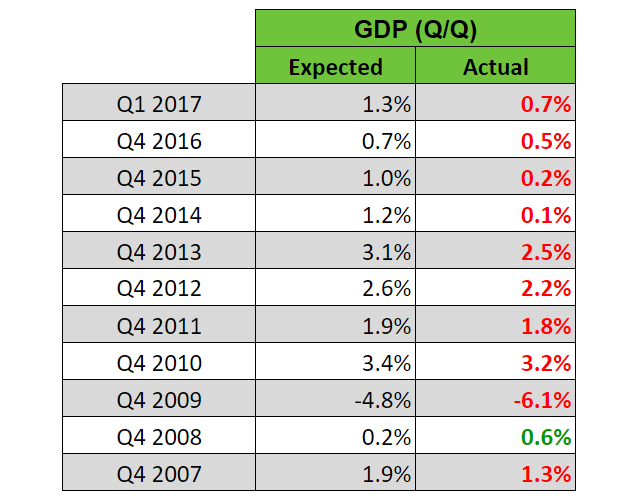 And unfortunately, that was a disappointment since the report revealed that the U.S. economy only grew by 2.6% quarter-on-quarter annualized in Q4 2018, missing the +3.0% consensus. However, the details of the report were not as disappointing since personal consumption expenditure surged by 3.8% quarter-on-quarter annualized, which is the strongest reading in six quarters. Business investment also accelerated from 4.7% to 6.8%, which is the best reading in three quarters. Exports, meanwhile, printed a stronger 6.9% increase (+2.1% previous). And as a side note, the GDP price index came in at 2.4%, beating expectations for 2.3% rise. The only negative thing about the report came from the 13.9% surge in imports (-0.7% previous), which subtracted 1.96% from total GDP growth. Overall, the details of the GDP report were actually good, despite the weaker-than-expected headline reading. And that’s why U.S. bond yields quickly recovered after sliding initially. However, the GDP report didn’t really have a noticeable effect on the Greenback’s price action since the Greenback was reeling at the time from U.S. Treasury Secretary Steven Mnuchin’s comment that “A weaker dollar is good for us as it relates to trade and opportunities.” The Greenback was also likely weighed down by trade war fears back then. It’s worth noting, though, that the Greenback’s price action became more mixed after the GDP report was released, so it’s possible that the GDP report enticed enough bulls to try and fight back against the bearish tide at the time. What’s expected for Q1’s advanced GDP report? The general consensus among most economists is that U.S. GDP only grew by 2.0% quarter-on-quarter annualized in Q1 2018. This is obviously slower than Q4 2017’s final estimate of +2.9%. Not only that, the GDP price index is also forecasted to tick lower from +2.3% to +2.1%. Economists therefore think that the U.S. economy was a bit weaker overall in Q1 2018. So, what do the available components for GDP growth have to say? Retail sales for all of Q1 2018 is 0.20% more compared to Q4 2017, so consumer spending will likely have a bigger contribution to Q1 GDP growth. Trade is still incomplete because the data for March has yet to be released. But so far, the available data for January and February point to a bigger trade deficit in Q1, so it’s likely that net trade will be an even bigger drag on GDP growth. The trade reports do show that imports of capital goods continue to rise at a steady pace. And that, together with the buildup in inventories and increase in building permits, may translate to another another solid reading for business inventories. Overall, the available components seem to point to another robust reading for GDP growth. However, net trade was likely an even bigger drag in Q1, so the reports do seem to support the consensus that GDP growth slowed further in Q1 2018. Let’s now move on to components of the the GDP price index. Well, they’re incomplete since the reports for March are not out yet. With that said, housing prices increased by 0.9% in January and then by 0.6% in February. The PCE price index, meanwhile, increased by 0.4% month-on-month in January and then increased by 0.2% in February. So far, so good. However, CPI fell by 0.1% month-on-month in March. The PCE price index does not always follow CPI, though, but that’s a bad sign. Given all that, it’s therefore highly likely that the GDP price index picked up the pace in Q1 2018. The only fly in the ointment is the March CPI report since that pointed to a slowdown. With that out of the way, let’s now take a look at the historical tendencies. And, well, there is indeed a strong historical tendency for Q1 GDP growth to be slower compared to Q4 GDP growth from the previous year. Even so, economists still tend to be too optimistic with their guesstimates, resulting in A LOT of downside surprises. And I do mean A LOT. As for the GDP price index, that tends to print a stronger reading in Q1, which is contrary to expectations but supports the available leading reports. However, economists also tend to overshoot their guesstimates for the GDP price index. Although that historical tendency has failed to hold in the last two years. To summarize, the leading reports point to another robust reading for GDP growth. However, net trade was likely an even bigger drag on GDP growth in Q1, which supports the consensus for a weaker rate of expansion in Q1 2018. 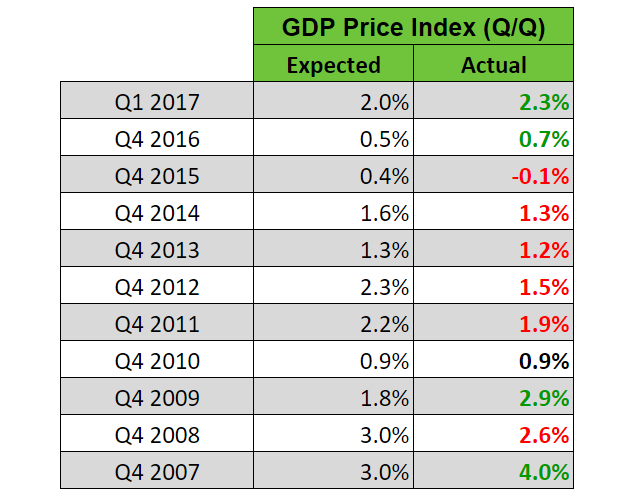 The GDP price index, meanwhile, likely picked up the pace in Q1, which is contrary to expectations for a slightly weaker reading. 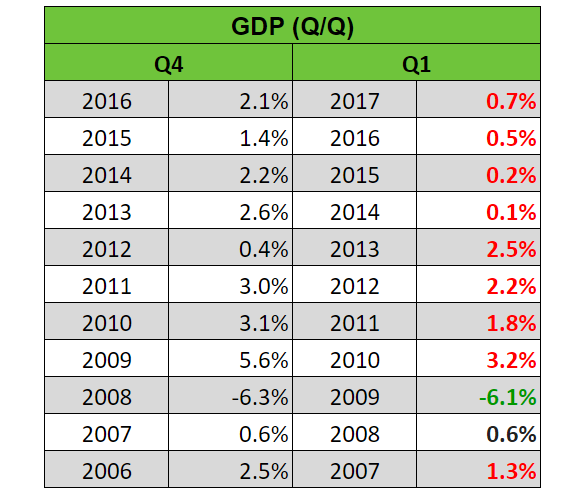 As for historical tendencies, there is a very strong tendency for Q1 GDP growth to be weaker compared to the previous year’s Q4 GDP growth, which is in-line with consensus. However, there’s also a very strong historical tendency for economists to be too optimistic with their guesstimates since there are A LOT of downside surprises. 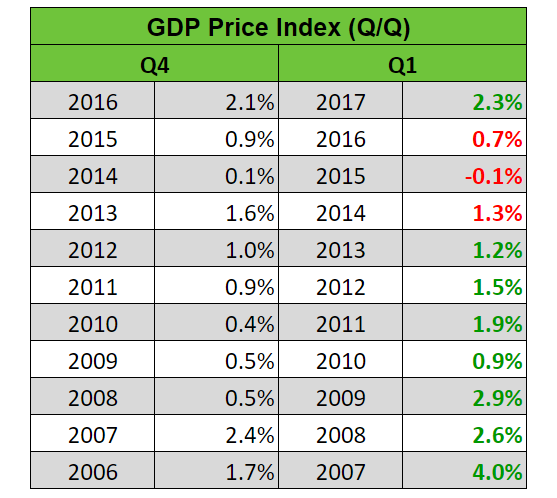 But on a more optimistic note, the GDP price index in Q1 is usually stronger compared to the reading for Q4 of the previous year. However, the historical tendency of analysts being too optimistic also applies to the GDP price index. But on another optimistic note, that historical tendency failed to hold in the last two years. But as always, keep in mind that we’re playing around with probabilities here. Anyhow, do note that traders used to react based on how the actual reading for GDP growth compared to the consensus reading. However, the GDP price index has been garnering more attention lately since it is more directly linked to rate hike expectations. Also, do note that the narrative since last week is the Greenback has been tracking the rise in U.S. bonds yields. And as mentioned earlier, bond yields took directional cues from the GDP report last time around, even though the Greenback had a more mixed performance. What I’m getting at here is that there’s a higher chance that tomorrow’s GDP report will have a bigger impact on the Greenback’s price action. Okay, that’s all I’ve got. And remember, if news trading ain’t your thing or if high volatility makes you uncomfortable, then remember that you always have the option to sit on the sidelines and wait for things to settle down.